The Nikon Coolpix P80 is the first ever "super-zoom" compact camera from Nikon, with its 18x zoom lens providing a massive focal range of 27-485mm. The Nikon P80 can easily cope with everything from wide-angle landscapes and close-up buildings, head and shoulder portraits, sports and even wildlife and bird photography, all from a discrete camera that weighs less than 400g and can fit inside a small bag. The Coolpix P80�s lens features Nikon�s VR (Vibration Reduction) image stabilisation system to help ensure that the majority of photos are sharp and don't suffer from camera-shake. In addition to the impressive optical technology on offer, there's also a 2.7 inch LCD screen and electronic viewfinder for image composition, a complete range of exposure controls with Auto, Program, Shutter-priority, Aperture-priority and full Manual mode, and an extensive ISO range of 64-6400. The Nikon P80 is up against some tough competition from the likes of Olympus, Fujifilm and Panasonic, who all released comparable models over a year ago, so can the latecomer gate-crash the party? At first glance the Nikon Coolpix P80 looks pretty much like a true digital SLR camera, with a chunky, rubberised handgrip, large lens barrel, pop-up flash and eye-level viewfinder. If you lined it up alongside DSLRs like Nikon's own D60, the Canon Digital EOS 450D and Sony A200, you would be hard pushed to spot the odd camera out, which is exactly what Nikon are aiming for. Indeed, the Olympus E-420 DSLR that we recently reviewed is actually a little bit smaller than the P80! All is revealed only when you look at the back of the P80 when it is turned on and see the LCD screen showing a live preview of the scene (something which many recent DSLR cameras can now do as well), or if you hold it up to your eye and look through the electronic viewfinder. Also the 18x fixed zoom also doesn't have the zoom or focus rings that you'll find on a DSLR lens. In terms of the direct competition, the P80's build quality surpasses the Olympus SP-570 UZ and Panasonic DMC-FZ18, and is on a par with the Fujifilm S8100fd. If we're being picky, there's a little bit of flex in the all-plastic body, but it's certainly a lot better built than the competitive �299 / $399 price-tag might suggest. 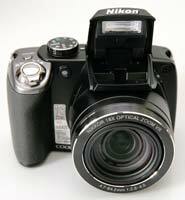 The huge 18x zoom lens obviously makes the Nikon Coolpix P80 one of the most versatile compacts in terms of focal range. The 27-486mm focal length should handle most photographic possibilities, with the exception of ultra wide-angle shots. The P80�s lens is impressively fast, with maximum apertures of f/2.8 at 27mm and f/4.5 at 486mm, although don�t expect to achieve DSLR-like blurred backgrounds due to the comparatively small sensor. 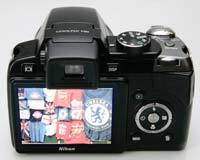 Nikon�s engineers have also provided a 1cm macro mode, so there really is very little that the P80 can�t cope with. There�s no need to carry round a bagful of heavy lenses as with a DSLR system, and because the lens is fixed, there�s little danger of unwanted dust getting onto the sensor. Thankfully Nikon have included their VR (Vibration Reduction) image stabilisation system to help prevent camera-shake, an essential feature on a camera like this, although annoyingly there isn't a dedicated button to turn it on and off (you have to turn the Mode Dial to Setup and then scroll through the menu system). In practice I found that the VR system makes a noticeable difference to the sharpness of the images, as shown in the examples on the Image Quality page. You can hear a slight mechanical whirring noise when anti-shake is turned on, but otherwise you don't really notice it, except that that you can use slower shutter speeds than normal and still take sharp photos. Thankfully leaving the anti-shake system on didn't negatively affect the battery-life, with the camera managing around 225 shots using the supplied Lithium-ion rechargeable battery. 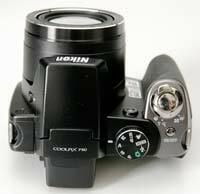 There are two different way of composing images with the Nikon Coolpix P80. As with the rest of the super-zoom competition, the P80 has an electronic viewfinder (EVF), with a resolution of 230,000 pixels. As this camera has largely been designed to replicate a DSLR, it means that you will invariably compose your images by holding the camera up to your eye. I found that while the P80's EVF is one of the better examples around, it doesn't keep up with the eye quite as quickly or precisely as an optical viewfinder, and it wasn't as comfortable to use as the Fujifilm S8000fd. On the plus side, you get a lot more visual feedback via the EVF than on most optical viewfinders, it offers 97% scene coverage and dioptre adjustment, and you can also playback your images on it if you so wish! I still much prefer a traditional, good quality optical viewfinder though, and this would be one of the main reasons for opting for a true DSLR instead of the Nikon Coolpix P80. The 2.7 inch LCD monitor on the back of the camera offers the same specification of 230,000 pixels resolution and 97% scene coverage, with five levels of brightness, anti-reflection coating, wide viewing angle on offer. 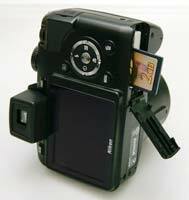 A button next to the electronic viewfinder switches between the EVF and LCD screen. There aren't too many external controls and buttons (13 in total) on the Coolpix P80, reflecting the fact that this is a camera in the mould of an entry-level DSLR. There's a traditional dial on the top that lets you select the different shooting modes, which is a typical feature of SLR cameras, and it enables you to quickly change between the various modes. The Nikon Coolpix P80 offers a range of advanced modes including shutter-priority, aperture-priority and manual, perfect for the photographer who wants to take full control. The Movie and various Scene modes for beginners are also accessed via this dial, along with the Setup menu. The latter feature is a rather annoying design flaw which spoils the otherwise well-designed menu system. The P80�s menu system uses a very clear icon-based system with 5 options shown onscreen at once, but Nikon have decided to split it in two, with the Menu button accessing the Shooting menu, and the mode dial option opening the Setup menu. I found myself constantly having to turn the mode dial round just to turn Vibration Reduction on and off, for example. It would have made much more sense to combine the Shooting and Setup menus in one, as there really aren't that many options anyway. There are a few interesting features that help the Nikon Coolpix P80 stand-out from the increasingly crowded super-zoom space. Distortion control automatically corrects barrel distortion, useful for all those 27mm shots of close-up architecture with converging verticals, but it does have to be turned on before you take a picture. Face-priority Autofocus can detect up to 12 faces in a scene just so long as they're looking directly at the camera, whilst In-Camera Red-Eye Fix automatically processes the picture to remove red-eye. D-Lighting is a long-standing Nikon technology that brightens the shadow areas of an image, although on the P80 it can only be applied to an image after it has been taken, via the Playback menu. Finally the Optimize image option allows you to tweak the look and feel of your images, with 6 presets and a Custom option on offer. The contrast, saturation and sharpening level of each preset can be individually adjusted too, so you should be able to find a setting that suits you. The start-up time from turning the Nikon Coolpix P80 on to being ready to take a photo is quick at less than 2 seconds, whilst zooming from the widest focal length to the longest takes around 4 seconds, understandable given the huge focal length on offer. Focusing is quick in good light and the camera achieves focus most of the time indoors or in low-light situations, helped by a powerful focus-assist lamp. The visibility, resolution and refresh rate of both the 2.7 inch LCD screen and the electronic viewfinder (EVF) are good. 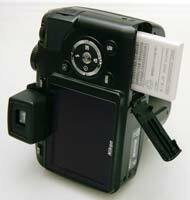 Using the single shot mode, it takes about 2 seconds to store a JPEG image, but there is a brief LCD blackout between each image during which you can't take another shot. In the Continuous shooting mode the camera takes just 1 frame per second at the highest image quality, limited to 9 frames, which is below average for this class of camera. There is also a Multi-shot 16 mode that takes 16 photos at 1.1 frames per second and arranges them into a single image, plus an Interval timer shooting mode, which is useful for things like astrophotography. Nikon are also heavily pushing their new Sports Continuous Scene Mode, which for shoots at 13fps for up to 30 frames, but it only works only when you set the resolution to 3 megapixels or lower. Once you have captured a photo, the Nikon Coolpix P80 has quite a good range of options when it comes to playing, reviewing and managing your images. You can instantly scroll through the images that you have taken, view thumbnails (up to 16 onscreen at the same time), zoom in and out up to 10x magnification, apply D-Lighting, set the print order, view a slide show, delete, protect, rotate, hide and copy an image, plus create a smaller version and add a black border. The Display button toggles between various views, including showing detailed settings information about each picture, such as the ISO rating and aperture/shutter speed, and a brightness-based histogram. In summary the Nikon Coolpix P80 effectively combines the main benefits of the DSLR and compact camera systems, and appeals to both beginners and the more experienced photographer alike. PhotographyBLOG is a member of the DIWA organisation. Our test results for the Nikon Coolpix P80 have been submitted to DIWA for comparison with test results for different samples of the same camera model supplied by other DIWA member sites.